Boystown's late night dancefloors will still be pumpin' until at least 4 a.m. But, starting this weekend, Halsted Street parking will end at midnight. That's because a just-passed city ordinance bans all parking along a half-mile stretch of Halsted Street from Belmont to Addison on weekend nights during peak season. The city gave the parking restriction a test run for two months last year, saying that the move was necessary to eliminate “car parties” and loitering in the LGBTQ nightlife district. Residents who heard about the plans at a community policing meeting last August welcomed the idea. One suggested starting the program on that very night while another said a 9 p.m. start would be even better for them. From April 1st to September 30th, parking will be prohibited on both sides of Halsted Street from Belmont to Addison from 11:59 p.m. on Fridays until 4 a.m. on Saturdays; from 11:59 p.m. on Saturdays until 4 a.m. on Sundays; and from 11:59 p.m. on Sundays until 4 a.m. on Mondays. 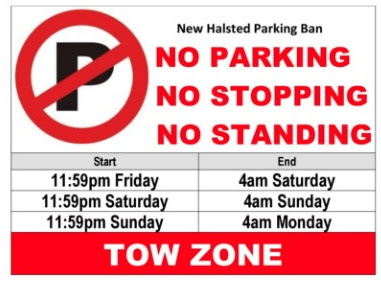 Parking on Halsted between Aldine and Belmont has been banned from midnight to 4 a.m. on Saturdays and Sundays between April 1 and September 30 for about four years. The restrictions were put in place after residents—many living in a condo building in the 3200 block of North Halsted—complained about late night music blasting from parked cars, dancing on sidewalks, and drug dealing. While introducing the expanded parking ban idea last year, 44th Ward Alderman Tom Tunney said the existing no parking zone “has been a success in the minds” of nearby residents and the 19th (Town Hall) Police District had suggested expanding the restrictions to Addison. Buslik said Halsted Street businesses had been included in the decision-making process.